What Is The Independent Chip Model (ICM)? Easy-to-understand guides for the independent chip model (ICM) in poker are few and far between, so I'm going to try hard to keep this article as concise and relevant to improving your Sit and Go tournament game as possible. In this article I aim to answer the question "what is the independent chip model?" and also highlight how you can go about working it out. What is the independent chip model? The independent chip model assigns $ value to your chip stack in a tournament. The amount of chips in play. If there are only 1,000 chips in play, then those 100 chips are quite valuable. However, if there are 100,000 chips in play, then 100 chips isn't really going to be worth all that much at all. Lets say you have 100 chips (out of 1,000 left at the table), there are 5 players left and only 1st place pays. The $ value of those 100 chips is not really a lot, as your chances of walking away from the tournament with some money in your pocket is quite slim. However, if there are 5 players left and there is an equal payout for 1st, 2nd, 3rd and 4th, the chance of you winning some money is not so bad, so your chips are worth a little more in terms of $ overall. Think about it, would you rather take a player's 100 chips when only 1st place pays or if 4 places pay equally (with 5 players left at the table)? You're going to see a better ROI in the long run by taking the player's chips when 4 places pay as opposed to 1. In the following section I will use the ICM idea of each chip being worth something in terms of $ for working out our overall prize pool equity based on the size of our chip stack. Using ICM to work out prize pool equity. If you have 5,000 chips and player B and C each have 2,500 chips, how much is your 5,000 going to win for you in the long run? In a tournament it's not like we can cash out our chips at any time for what we think they're worth. We have to continue playing to see whether we take down 1st, 2nd or 3rd prize in the tournament. Of course, the more chips we have compared to the other players the more likely it is we will win one of the top prizes. The current size of our stack. The current size of the other players' stacks. The amount of money in the prize pool and how much you get for coming 1st, 2nd, 3rd and so on (prize pool distribution). Basic prize pool equity example. Player A: (2,500 chips) = $25 equity. Player B: (2,500 chips) = $25 equity. Player C: (2,500 chips) = $25 equity. Player D: (2,500 chips) = $25 equity. This equity business obviously get's more complicated as each player's chip stack varies, but I hope this gives you a basic idea of prize pool equity. How to work out prize pool equity. As we have just mentioned, we want to work out how much $ equity we have in the tournament based on the size of our stack and our opponents' stack sizes. When we work out our prize pool equity all we care about is the current size of the stacks. We then use that information to work out how much money each player is expected to win from the tournament on average. The more chips you have, the more money you are likely to win. Each individual player's skill is not factored in to the equation. It's quite basic, but the more chips you have the higher the probability is that you're going to win one of the top prizes. Furthermore, ICM doesn't factor in any luck that will be involved in the tournament. We're just looking at stack sizes for an indication of how much money each player will be winning on average, nothing else. Working out prize pool equity example. It requires a hefty amount of mathematics and it's quite possibly the least fun thing to work out in the world. You're never going to want to work it out by yourself anyway. It just takes ages. 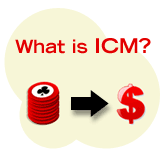 ICM calculators make working out prize pool equity super easy. I'm going to input the numbers in to this awesome ICM calculator and skip to the results. I might create a walkthrough to working out ICM by hand in the future, but until then this ICM calculator is good enough for now. Player A: (5,000 chips) = $38.33 equity. Player B: (2,500 chips) = $30.83 equity. Player C: (2,500 chips) = $30.83 equity. Therefore, with 5,000 chips Player A expects to win $38.33 from the tournament on average. Player B expects to win $30.83 on average and so on. Try playing with the ICM calculator yourself to see how much money you expect to win on average from different payout structures based on how many chips you and your opponents have. It's pretty cool. So that's a quick overview of the independent chip model and ICM for you. Nothing groundbreaking, but the sole intention of this article was to give you a basic understanding of the independent chip model and prize pool equity. Working out each player's equity in the tournament is cool and stuff, but this information isn't very practical just yet. In the next step I'm going to use this information to work out whether or not you should risk chips by calling all-ins toward the end of a tournament. The how to use ICM in tournaments article will essentially help you to answer the question "is the risk worth the reward?" when faced with tricky all-in decisions in Sit and Go tournaments.